This Giveaway is Closed. Watch for another great give away at in January. 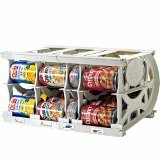 I am giving away a Shelf Reliance Harvest 72″ Food Rotation System. The Harvest 72 comes in two configurations. One holds small, medium and large cans. The other holds only large cans. The winner can choose which would work better for their home. You are eligible for up to 4 entries as outlined below. The giveaway starts now and ends on September 30, 2011 at midnight, MST. So be sure to submit your comments before then! We will announce the winner here on our blog, October 1st. Good luck! Be sure to check back to see if you are the winner. The winner will have 48 hours to claim their prize. Anyone who comments on this blog entry will be entered to win the Harvest 72″. Each comment counts as a separate entry. You must be a follower of Cooking with My Food Storage to qualify ( I will check so don't forget this step). There are 4 ways to enter, you can do just one of them or all 4. (3) The 3rd entry is earned by submitting a Reader Recipe. 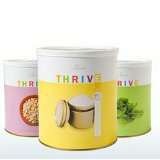 It is easy fill out our easy form with your favorite food storage recipe. When you have submitted the form please leave a comment that includes your first and last name and says something like “I submitted Chicken Pasta as a reader recipe” You recipe might be featured in an upcoming “Reader Recipe” post. To submit a recipe go to Reader Recipe. 4. If you decide to purchase a Harvest through me before the giveaway ends and you win I will be happy to refund your money. 5. If you are leaving an comment as anonymous be sure to leave your name. I can't award a price to anonymous, that would just be silly. It’s time to get blogging, get clicking, and get commenting! I’m so excited to give this Harvest 72″ away!